Subscription boxes are large shoebox type boxes that are filled with all kinds of goodies! You can subscribe to boxes filled with foods, clothes, books or other fun trinkets. Large companies are also now jumping on the subscription box bandwagon in order to help their brand gain more momentum. Some boxes send out monthly, bi-monthly or quarterly. The possibilities when it comes to subscription boxes seem almost endless. There are even some that use their boxes in order to give back to their communities! Like Love with Food that donates meals to local food banks! There is no denying the ever-growing popularity of subscription boxes and because of that, companies like Cratejoy took notice and wanted to make the process even easier. To start your own business, you will need to be set up with a website, get linked in with clients, get set up with e-mail and shipping. The great part is, Cratejoy takes care of all of this for you! All you need to do is come up with some great ideas for what you want to put into your subscription box! This is where you get to be creative when coming up with your own ideas. Perhaps you are a very crafty person and want to add in some of your homemade keepsakes into your boxes. One Cratejoy subscription box owner took her career as an occupational therapist as the inspiration behind her boxes. In order to work from home, she created boxes with great toys to help parents work with their children one on one. You can check out her wildly popular boxes here. Cratejoy was started by, Amir and Alex who were huge fans of subscription boxes. They wanted to come up with a company that allowed people to start their own subscription box business. It seemed that the technology in similar companies was lacking and they wanted to make it easier. They wanted Cratejoy to be an all-in-one platform for new entrepreneurs or even for highly experienced businesses. So, in 2013, Cratejoy was launched and has since turned into a huge platform for all subscription box owners and their subscribers. When Cratejoy was founded it was done so with the idea of helping all levels of businesses. Being able to quit your day job, be your own boss, and live your passion is easy with all the ways Cratejoy is designed to help new entrepreneurs succeed. Website – The site’s easy-to-use web designer gives anybody the ability to be able to create a clean, quality site without any coding or technical experience. Support – To make things even better, Cratejoy has round the clock support through e-mail and live chat. Plus, added bonuses like their Facebook group just for all Cratejoy box owners to interact and help one another directly. Tools and analytics – Cratejoy will keep all your tools and analytics in one place so you can easily manage your subscribers, traffic and other aspects of your business. Cratejoy’s Marketplace – The major way to create a successful subscription box company relies solely on getting the word out about your boxes. Cratejoy’s Marketplace does this for you! They have created a Marketplace that is easy for potential subscribers to find your box. In fact, one entrepreneur, says she still sees 50% of her traffic coming from the Marketplace. Increased exposure – You also have the opportunity to be covered in media placements as well as in e-mail newsletters. The blog – Cratejoy also has their Box Insider blog where subscription box owners can share their stories and successes on the blog. Because the blog gets around 150K views a month, this is again another great option for exposure. Shipping and e-mail – You will also gain access to the most popular shipping and e-mail providers. Training – In order to help you succeed, you can also take advantage of Cratejoy’s training programs like Subscription School. During the course you will get full training on how to run a successful subscription box business. As you can see, Cratejoy is a great idea for those of you just getting started because all their features are designed to help you succeed. If you have already begun your subscription box business but find that you aren’t being given as much help or guidance as you would like in order to succeed, Cratejoy is happy to help! If you are currently running your own business, subscription boxes can be a great option to help the business grow! You will be able to make data-driven decisions to help scale your business. You will also get expert support tailored to enterprise level merchants. 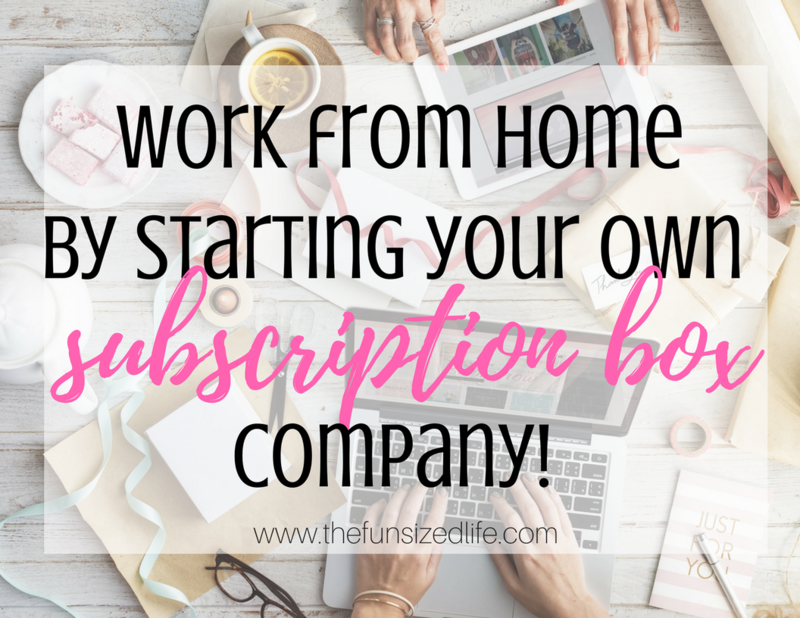 Getting started with your own subscription box company is so easy. Very little is required for you to get started. In fact, you can take advantage of a 2 week FREE trial! After that, it’s just $39 a month to get started on creating your own work from home business! On top of that, if you spread the word and recommend Cratejoy to others, they will give you an additional 3 months of service totally free! Everything you need to get started is already all in one place! I am a firm believer in following your heart and chasing your dreams. Starting the blog was mine. If coming up with your own ideas for subscription boxes sounds like something you would love to easily do from home, then don’t waste any time getting started! All the questions and kinks will be worked out. Especially with all the guidance given to you through Cratejoy! Start your own subscription box now! I am looking for a work from home internet busuness for quite some time now. The subscription box business seems very interesting to me. Doesn’t it, though? I can definitely see myself giving this a try in the future.